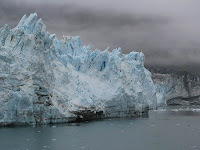 I recently saw Glacier Bay and it is as amazing as I have always heard. There was plenty of inspiration for a whole series of paintings. One of the photos from the trip is above.